Our top-quality Italy flags conform to all official specifications. Emblems and designs are executed with the highest possible degree of accuracy in regard to detail, color shades, placement and proportion to flag size. 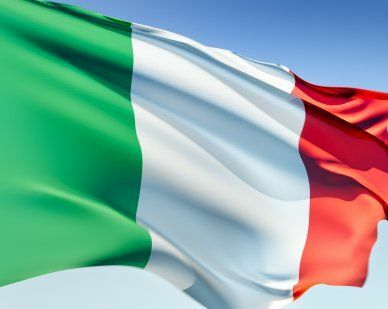 The Italian flag is one of the most easily recognizable flags in the world. The current flag was adopted on June 19, 1946. The tri-color flag was first used by French controlled Lombardy region of Italy in the late 1700's. It is thought that Napoleon Bonaparte replaced the blue on the French flag with green because he liked the color. Another legend states that the colors may have been based on the original military uniforms from Milan. The flag originally contained the Italian royal coat of arms from the King of Sardinia but it was removed in 1946 when the monarchy was abolished.